IMCDb.org: 2000 Mercedes-Benz Sprinter 308 CDI by Kögel [T1N] in "Das Ende einer Maus ist der Anfang einer Katze, 2011"
Looks like one of 8,900 308 CDI bodied by Kögel for German Postal Services from 2000 to 2002. Only for the Post? Not for UPS, too? There are Sprinter-based UPS-Vans running here, too. 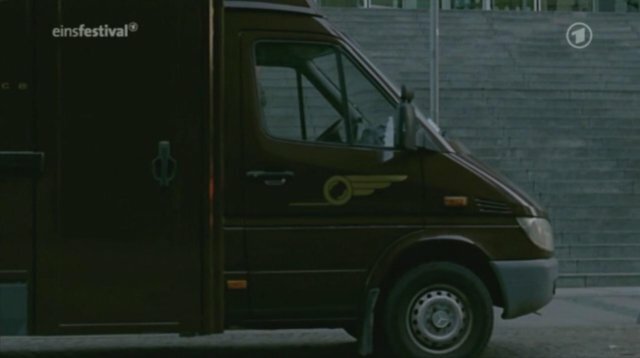 The UPS Sprinters are made by Spier (called 'P45' in UPS jargon) and look a bit more robust, like the typical Vario based UPS vans that are bodied by the same company.